The rise of global terrorism has pushed public protection to the top of the Government’s agenda. Striking a balance between the functionality of a building and the protection of the people inside has given rise to a new collection of construction products designed to be fit for purpose in this new age of counter-terrorism, and bomb blast doors are one such product proving popular in this arena. Stephen Badgery, Key Account Manager for Ingersoll Rand, explores how the bomb blast market has worked to satisfy the accessibility versus protection argument. The very nature of terrorism puts crowded public places at the very top of the perpetrator’s hit list and buildings such as airports, central train stations, shopping centres and sports stadiums are all considered high risk environments. For the owners and managers of these facilities, the free movement of large crowds through restrictive entrances and exits poses a potential crush risk if they are not adequate in their size and performance. Standard automatic doors are manufactured in line with strict EU guidelines to ensure such risks are minimised; however introducing the additional need for counter-terrorism protection raises the question, will accessibility be jeopardised? This uncertainty is largely due to lack of understanding, with most construction professionals having never come into contact with a bomb blast door. Visions of heavy bank vault and panic room doors make many wonder how such protection could be applied to an airport or Government Embassy building, when the truth is, with such a similar appearance to standard doors, combined efforts from manufacturers and specifiers can achieve the desired level of traffic movement with the added protection required in a high-risk environment. 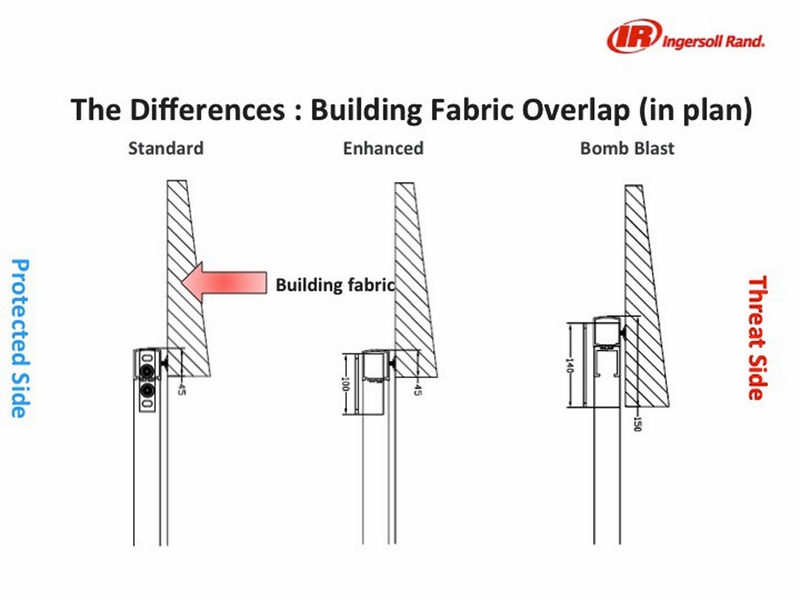 As part of this process, Ingersoll Rand’s Dor-O-Matic bomb blast doors have been specifically designed to meet the same EU regulations for functionality as their standard automatic counterparts. It is important to remember that whilst there are numerous options for doorsets in low-risk environments, enhanced security and bomb blast doors are limited to single and double sliding automatic doors and it is the regulations for these doors in specific that bomb blast doors are designed to meet. European standard EN 16005 came into force in April 2013 as a reviewed addition to the Building Regulations of 2010 and has been designed to safeguard pedestrians from accidents caused by the design and installation of automatic doors. Formed from various existing standards, including BS 7036 parts 1-5 which has been recognised as a code of practice since 1996 and the German standard DIN 18650, the new standard is intended to facilitate cross-border trading and is the first formalised pan-European standard for automatic doors. All EU countries must comply with EN 16005, as must any products manufactured outside the EU for use inside it. The standard is also used outside the EU, including countries in the Middle East and Asia, making it the most widely used standard in the market place. Manufacturing efforts aside, to fully comply with this standard, it is the responsibility of the specifier to oversee the correct installation of the enhanced security or bomb blast doorsets, ensuring that the fitting meets all necessary safety recommendations. Whilst bomb blast doors are designed and manufactured to be similar in appearance and with the same access performance as a standard automatic door, significant alternations in their fabrication make them capable of unrivalled protection in the event of a terrorist bomb attack. 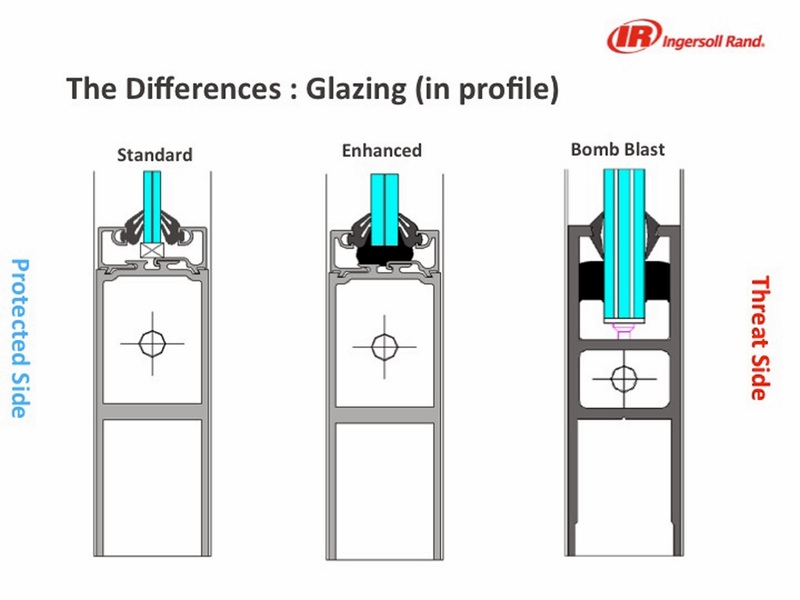 Upgraded header fixing bolts, reduced fixing centres and a deformable plate to absorb the initial blast are just some of the altered areas of specification that make bomb blast doors unique. Coupled with glazing and threshold enhancements, increased extrusion wall thickness and an enhanced operating system with structural steels to cope with the increased weight, bomb blast doors can withstand massive over pressures that would otherwise devastate the inside of a building. Testing of these products is rigorous and doorsets are subjected to the effects of a 100kg TNT explosive device at both 45m and 25m, in accordance with the US General Services Administration, International Standards Organisation (ISO) and Bomb Blast Standards. Blast gauges are used to measure the blast pressure and blast loading for each test and as a result, the doorset is awarded a standard in line with ISO EXV 45 and ISO EXV 25. As the construction industry continues to demand counter-terrorism products for the protection of high risk environments, manufacturers will strive to deliver more sophisticated solutions to market. Satisfying the functionality versus protection argument will undoubtedly continue as a key consideration in the development of these products, and the evolution of bomb blast doors will follow suit to ensure public protection remains at the forefront of design. 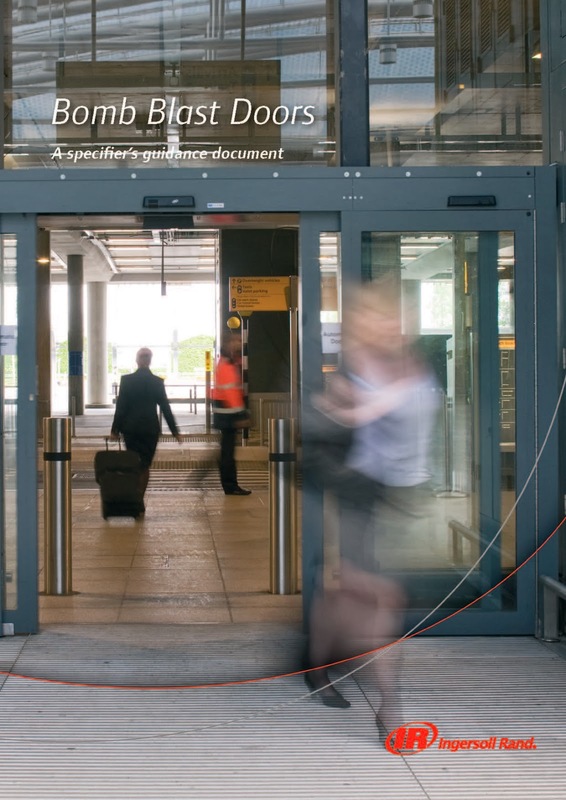 Ingersoll Rand recently launched a white paper on bomb blast doors, as a comprehensive guidance document for specifiers of high-risk building projects. Designed to provide an overview of the current regulatory environment surrounding counter-terrorism measures in the construction of high-risk environments, the paper offers specifying professionals a wider understanding of advisory documents, quality standards and market leading products.